Howdy.:-).. Just to let you know how these things work, the what and where of our digital communications. Ways to add or contribute: use the group email, posting to the facebook private group or upload to our shared photo store, or the iceberger website. Just ask, happy to help. This is a collection of information about us, our icy moment stories, swimmer adventures, results, links and videos, etc. We also receive general queries from the public via the Contact Us form. The site is accessible via the web and mobile devices. It has gadgets for searching, sorting, subscribing, etc. To submit stories to it, just email to brightonicebergers@gmail.com. Any iceberger can submit stories or photos. If you want to help manage the site, we'll train you too. We have a Twitter account at 'Brighton Iceberger' or @Biceberger, you can follow, but we haven't begun actively using it too. On Google+ you can friend with 'brightonIcebergers@gmail.com'. This is not very active. The complete members list is stored online. It contains names, telephones, emails and emergency contact details. Email: brightonicebergers@gmail.com, or Don.W or John.S to get a PDF copy. The list is reviewed periodically and details updated or non members removed. If you want photo's or videos to be available and stored in our online account in perpetuity please contact us to get the login details for uploading photo's and sharing, or for videos. We use picasa and youtube. Events Information is sent out via Email regularly by the committee. We have Contact Us form and Merchandise form. If you need others, please let us know. You can update your contact details anytime here: Update your details. Questions welcome. 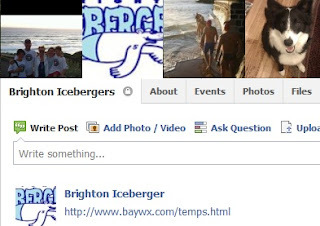 Submit online or email: brightonicebergers@gmail.com or discuss with the committee or John Scanlon.